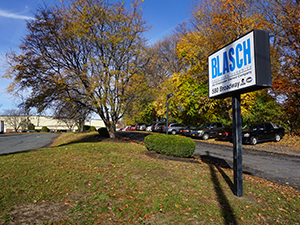 Founded in 1979, Blasch Precision Ceramics, Inc., an Albany, NY based manufacturing company, produces and markets net shape ceramic and refractory components to a wide variety of industrial markets worldwide. These industries include specialty alloys, non-ferrous metals, chemical/petrochemical processing, power generation, industrial process heating and mining. The patented Blasch Process is a unique, proprietary forming method developed to produce net shape and near net shape ceramic parts exhibiting very attractive physical properties. Many of the products produced by Blasch have complex shapes that could not be produced with other existing ceramic technology. As a result, several patents exist covering Blasch’s unique processes and technology. We are dedicated to the expansion of our business by identifying and capitalizing on opportunities for innovative ceramic solutions and customer service within growing niche market areas at early stage, as well as increasing our market share within existing markets. In addition, we are committed to the further development of our products and technology, thereby providing the company with sustainable competitive technical advantages in each market. Blasch strives for excellence in the area of industrial ceramic components, employing an engineered systems approach to solve customer problems and further improve and prolong the life of ceramic and refractory parts. Dedicated material, design and application engineers continuously develop materials and design parts to satisfy specific customer needs. Blasch Precision Ceramics is a Customer-First manufacturing company dedicated to delivering world-class service and high-end quality products to its customers. For almost a decade, Blasch Precision Ceramics, Inc. has been an employee owned company. Using the ESOP as a foundation for quality improvements such as lean manufacturing, Blasch and its partners/employees strive to ensure the consistency and performance our customers have grown to expect and appreciate. The ownership culture drives every aspect of our business and motivates partners in their relentless pursuit of growth and excellence. In addition to providing a competitive return to our investors and shareholders, Blasch is dedicated to the personal and professional development of its employees and to creating career opportunities through the growth and expansion of our business, in a safe, healthy and friendly working environment.